1906 - Canada published the world's first national atlas, demonstrating the skills at mapmaking which had been honed by years of charting this vast land. 1909 - Marquis wheat was first distributed to prairie farmers in 1909. 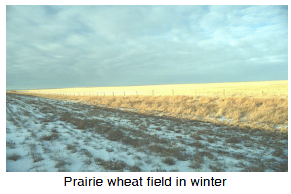 It was a new strain of wheat developed to thrive in the short growing season of the Canadian prairie. It could mature in 100 days which greatly reduced the risk of losing a crop to an early frost as often happened before. By 1920, 90 percent of Canadian wheat farms used Marquis wheat. It was developed by Charles Saunders, a reluctant scientist, who had originally wanted to be a musician. 1917 - The Russian Revolution established the first communist regime, overthrowing the tsar of Russia. Lenin became the first leader of Communist Russia, which changed its name to the USSR (Union of Soviet Socialist Republics).